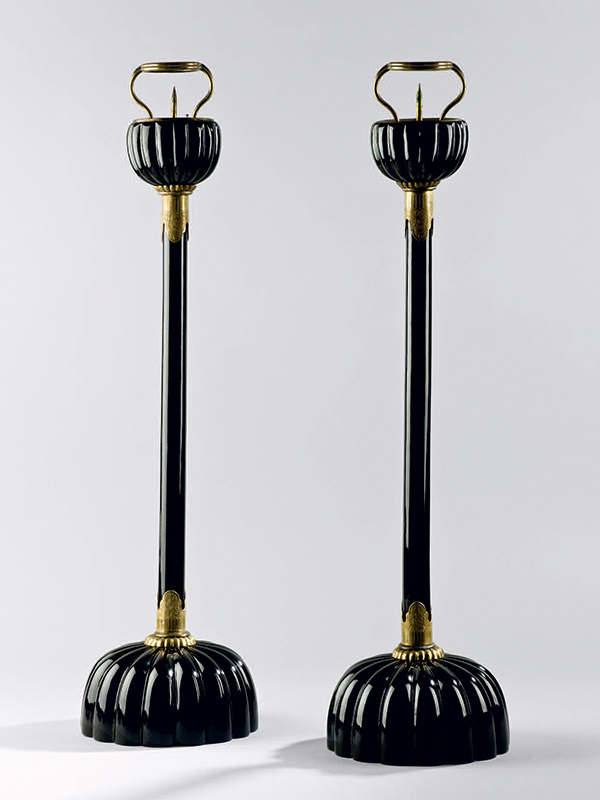 A pair of lacquered wood candlesticks, each with a large, solid hemispherical base that is carved in the form of a stylised chrysanthemum flower. A tall cylindrical stem extends from the base and is crowned by a chrysanthemum­-shaped drip pan in the form of a deep cup. This is mounted with a spike and bracket for holding a candle. The tall cylindrical stem is decorated with two foliate yellow copper mounts with chrysanthemum­-shaped finials. The mounts are engraved with leaves. Tall candlesticks in metal, plain wood and lacquered wood were intended for use in Buddhist temples or Samurai mansions in Japan, where they were usually placed on or near the altar, either in pairs or in sets of four. The large size and the yellow copper mounts of these handsome candlesticks are unusual, making them a striking example of this type. The candlesticks are finished with a thick layer of plain black lacquer, known as roiro in Japanese, literally meaning ‘wax colour’. This lacquering technique involves applying many layers of lacquer, with the upper layer coated with a special black lacquer and polished off with charcoal, thereby creating the effect of a durable hard­-surfaced finish.